Korg, the company that invented the first hand-held electronic tuner, has now created the world's smallest metronome. 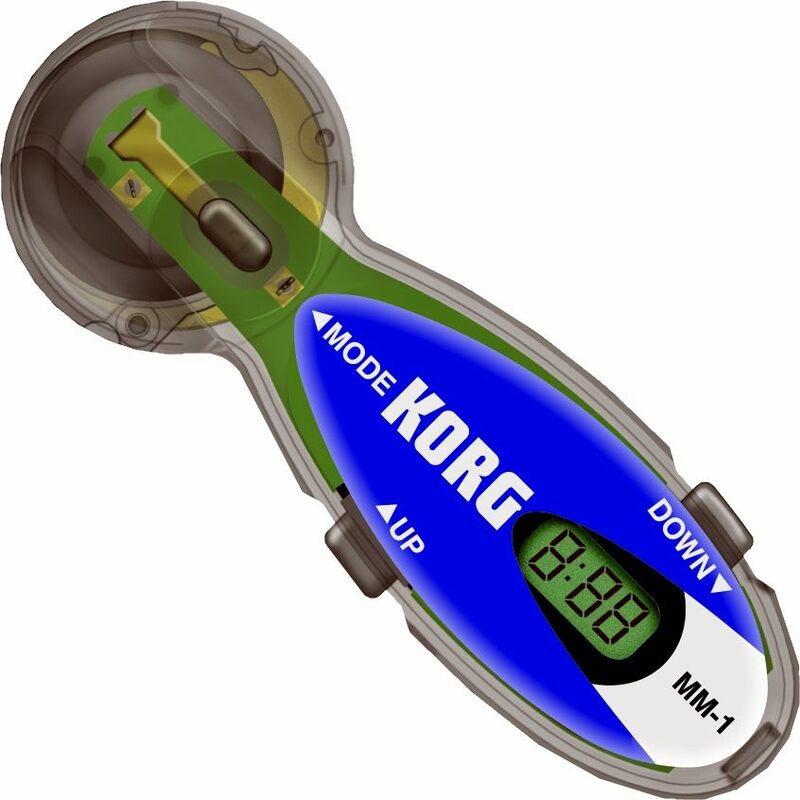 The Korg MM-1, an on-ear micro metronome, is only slightly larger than an earring, but packs all the functionality you could want for rhythm training. Fits comfortably on your ear. Only you can hear it. Dimensions (W x D x H): 0.64 x 1.83 x 0.66 in. Overall: Do not waste your money. This toy has tempo settings only in increments of 4 at slow tempos, 6 at faster tempos, and 8 at fast tempos. It has no volume control, and you need a magnifying glass to read the display. 11 of 17 people (64.71%) found this review helpful. Did you? "You Have a MetroGnome In Your Ear!" Sound: As a Drum Major, who needs his hands free, this product helps more than most people realize. This can give an exact tempo without having to listen to a big bulky metronome, put it back into your pocket, and more than likely forget the tempo in the first place. This one, however, allows you to simply keep the metronome in your ear, allowing for easy access, sure tempo, and free hands for conducting. Feature: The multiple time signatures and other goodies, such as a built in subdivider make this product very helpful. Ease of Use: The lack of buttons makes the mode choice and other options difficult to operate, but after a day of use one gets used to it and the product works very well. Quality: Only downside is its size. This prduct is very easy to lose on a marching field... trust me. It is a bear trying to find it again. Value: For value, this metronome beats out the others I've looked at. For the number of options and size, this item is very well priced and worth its cost. Manufacturer Support: Haven't had any trouble with it. The Wow Factor: It's so freaking small! Nobody knows where the heck the little beeping is coming from, all they know is that it's there! Overall: I'll probably keep it until it gets lost or trampled... Both being very possible occurances.